"The metal is just battle armour. The real Dalek creature is inside." I don't want this to be interpretted as being a light-hearted joke-essay, and although it might seem odd to write about Autism and Doctor Who simultaneously, I shall be looking seriously at the links between autistic behaviour and Dalek behaviour, as a way to explain how and why our own society stigmatises and judges them both. There are, of course, many more reasons why Daleks are NOT like autistic individuals, but that does not negate the interest that can be found in their similarities. Essentially, what I am saying is that autistic people, unlike Daleks, don't pose a threat to human existence and in fact, this essay will be showing how society generally mistreats people with Autism by its misinterpretations. More so, I see the link in the way in which, when watching Doctor Who, we almost instinctively attribute character and conscience to these supposedly insentient beings – not because we are led to do so by the scriptwriters but because it is part of our inbuilt psychosocial constitution: we constantly strive to attribute meaning and purpose to the actions of others, and in this, we are guilty of speciescentricism. We strive to ‘make human’ the Daleks, in the same way that many in society try to ‘make 'normal'’ those individuals with autism by applying their own value judgements. 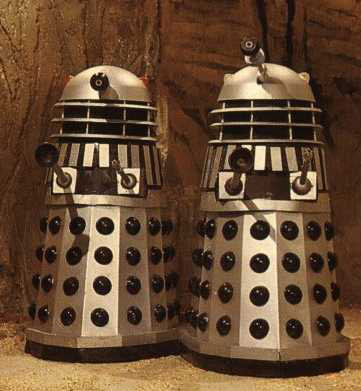 Let us now investigate the ways in which the Daleks share similarities with aspects of Autism. When one thinks of a Dalek, one is likely to conjure up the image of the metal shell (as in the above image) – when in fact, the Dalek itself is a betentacled ‘pink and greenish blob’. It is the outer aesthetic presentation of the Dalek, with its polycarbide peppershaker armour, eyestalk and gunstick, that strikes fear – the Dalek itself is considerably less intimidating. The large disparity between the outward appearance of the Dalek and the actual inner being is similar to the effects of Mindblindness, a concept developed by Cambridge’s own Prof. Simon Baron-Cohen. The autistic individual can conceive of the affective experience of others – their emotions and thoughts –only in the same way that a colourblind individual can ‘appreciate’ the colours are. The colour-blind individual may know what ‘pink’ is, but they cannot themselves experience and thus truly understand it. Similarly, the autistic individual, mindblind, may often inadvertently, and at times inescapably, present himself as socially aloof, or as unresponsive and socially awkward. Likewise, the Dalek inexorably presents itself as ruthless and callous. What both the Dalek and the autistic individual share is the fact that they are bound to their genesis – what goes on in their heads is, to a large degree, a product of something outside of their control and for this very reason, their actions are wrongly perceived to be negotiated when in fact, they cannot do things any other way. This links in to the Nietzschean concept of the ‘Lamb’s Anger’ – it is reasonable for a lamb to fear and hate the birds of prey which circle it from above, but it is wholly unreasonable to expect the bird of prey to do otherwise. In the same way that one cannot reason with the condor about the emotional repercussions of its predation, we resent neither the actions of the Dalek, nor the behaviours of autistic individuals. The next parallel is the reliance of both on logic and machinery as a way of explaining and experiencing worldly experience. Tragically, both the Daleks and autistic individuals are aware of the weaknesses of this, and recognise its shortcomings for themselves. Uta Frith, in ‘Autism: Explaining the Enigma’, emphasises the tragic paradox that very often, the thing autistic individuals may feel themselves lacking in most is social contact, and their social behaviours tend always to marginalise them. They are aware of how their reliance on logic affects their capacity to function in the pragmatic world of conversation. This is comparable with the Daleks, whose reliance upon a strict hierarchy stifles their individual personality – they see their shortcomings but, being ruthless, they enslaved non-Dalek species to compensate. The virtues of logic are not to be underestimated – the disregard for the subjective allows the Daleks to focus single-mindedly upon their goals. The disregard for the subjective similarly enables autistic individuals to occupy themselves in solitary activity, to develop and foster huge skill in the objective sciences and such like. But despite this, the reliance on logic makes it difficult to function socially, which in reality, proves itself to be hugely important in day-to-day existence. There are more examples that I could state – the ‘electronic voice’ of the Daleks which, for its lack of emotion, appears so strange and chilling, is comparable to the monotony of many individuals with certain types of autism – but for now, I shall leave just these two points. To summarise, there are links between the two which can be used to explain the behaviours of each of them. The Dalek, though frightening in its single-mindedness, cannot be expected to behave in any other way. The autistic individual, though not always subscribing to socially normative behaviour, cannot be blamed, nor should they be reprimanded, for it. The negative image that is held of Daleks and autistic individuals, though the two are, and I emphasise once more, very different, is that they are mysterious because of their difference – what makes both appear strange to many people is that they defy some of the characteristics which are perceived to be normal.